This apron is my entry for Tie One On's Floral Fun theme aprons. I used the Comfortable Apron pattern from the book Vintage Notions (see my review of the book here and photo of pattern below). 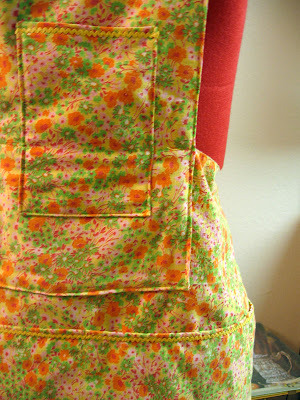 I love wearing aprons and made a couple of aprons using patterns by Mary Brooks Picken before. The apron took about two and a half hours to make from start to finish. The instructions are the originals published in 1926 and there are not many illustrations. The instructions are written in paragraph form rather than step by step so you have to read rather carefully. I highly recommend looking at the notes in the back of the book as well. The fabric is from a roll of vintage cotton that I inherited from my grandmother (used as a lining in this project). The lace trim is from a bulk bundle that I purchased at Michael Levine downtown. One thing I really enjoy about the vintage patterns is the instructions on making the pattern. You simply tear a length of fabric, draw lines between certain points and cut. It's so simple. I love it. Above is the fabric cut away to form the bib and skirt of the apron. The hardest part for me to figure out was how to attach the side belt to the bib. Here are some notes on how I did it. Hem the sides of the bib and the skirt. Baste top edge of skirt (from "e to d") and lightly gather. Pin folded strap over gathered top edge of skirt as above. Fold edge of bib on top of strap, making a pleat and covering the end of the strap. See above for right side photo. Below is the wrong side. Next, I top stitched the strap in place. The instructions say to use a blanket stitch to finish but in the interest of time, I skipped it. The straps were not long enough to tie so I adhered to the instructions and made a buttonhole as a closure. In fact, I made three buttonholes so that I could tighten or loosen the apron as needed (see above). 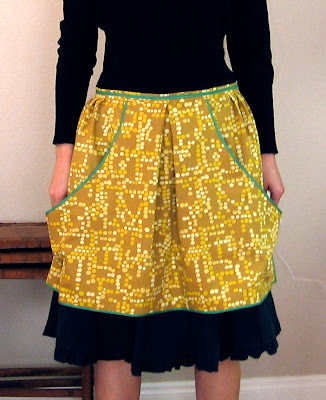 It's a pretty apron in the end but the hip gathers are not all that flattering. It was fun to make and it would be fun to try the blanket stitch finish sometime. 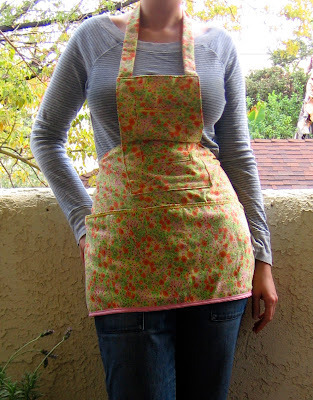 I made this apron from a vintage pillowcase for the contest put on by the Handmade Parade blog. It's a full apron with pockets around the bottom and one in the center front. The yellow rick-rack was the original trim on the pillowcase and now trims the pockets. The pink bias tape was added to finish the raw edges. The above schematic is a not-to-scale very rough sketch of how I used the fabric. I made some adjustments after I started cutting to get proportions that looked appealing. The top of the apron and the patch pocket attached to it are both faced. I used up the scraps for the pocket. I used the selvedge edge of the fabric at the waistline and applied bias tape around the sides and bottom. One of the unplanned proportion adjustments I made was to apply the top of the apron on top of the skirt as seen in the sketch below. I can't say how much I love aprons. I've taken to wearing them while cooking and cleaning, even if I'm not wearing clothes that require protection. I feel like with the apron on I can really get to work. The apron is a uniform. I'm not ready until I have it on. I didn't always feel quite so strongly about aprons. I used to only wear them while baking or cooking for an extended period of time. Wearing one while cleaning started when I was living in my last apartment. The sink was kind of low and I found myself getting wet while washing dishes (I was the only dishwasher there, no fancy machines to do the dirty work). The habit has stuck and I sometimes find myself happily wearing an apron all day long. A bonus is that when you're done cooking and have commenced eating, the apron acts like a giant bib although hopefully more flattering and grown-up. 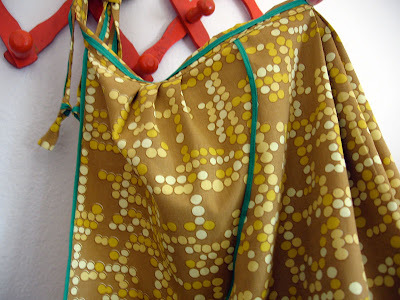 This apron is made from vintage fabric, bias tape and pattern. According to the pattern, it's a clothespin apron, basically a giant kangaroo style pocket. I inherited the fabric from my grandma. It's 36 inches wide and I still have a few yards left. The apron only required one yard of fabric. I had to make a seam at the bottom of the apron because my fabric is not double-sided. I also added a pleat at the center to get the right width-height proportions. Isn't it cute? I might be getting on an apron making kick.